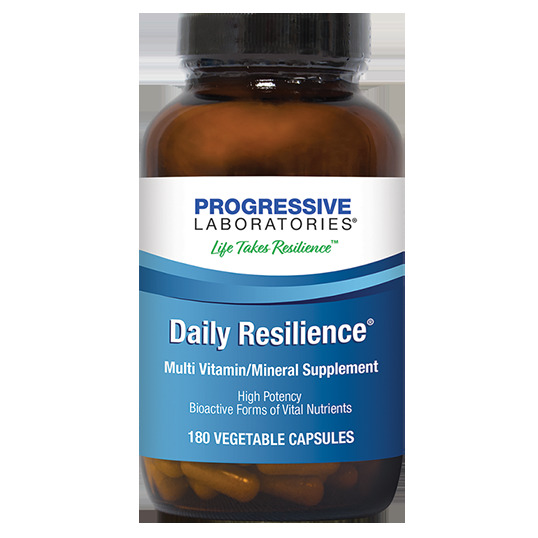 Daily Resilience® is a unique multivitamin/mineral (MVM) complex combining vitamins and minerals in their most complete, biologically active forms in combination with the world’s healthiest superfoods. This unique formula’s whole nutrient families work better than the isolated nutrients found in most multivitamin/ minerals. Bioactive nutrient forms improve absorption and utilization, and superfoods provide a spectrum of important phytonutrients that even healthy diets may be lacking. Daily Resilience® incorporates a Cell Resilience Blend™ of superfoods and nutrients that help protect every cell of the body from the ravages of free radical damage. Take six vegetable capsules daily in divided doses with meals, or as directed by a health care professional.